An implosion will take place in South Beach within weeks, a developer has told RE:MiamiBeach. The 10-story shell of the former South Shore Hospital, which has sat vacant for nearly a decade, will be detonated in a controlled demolition. An implosion permit has already been issued. Russell Galbut said the implosion is expected to take place at 8:00 am on April 14th, a Sunday morning. 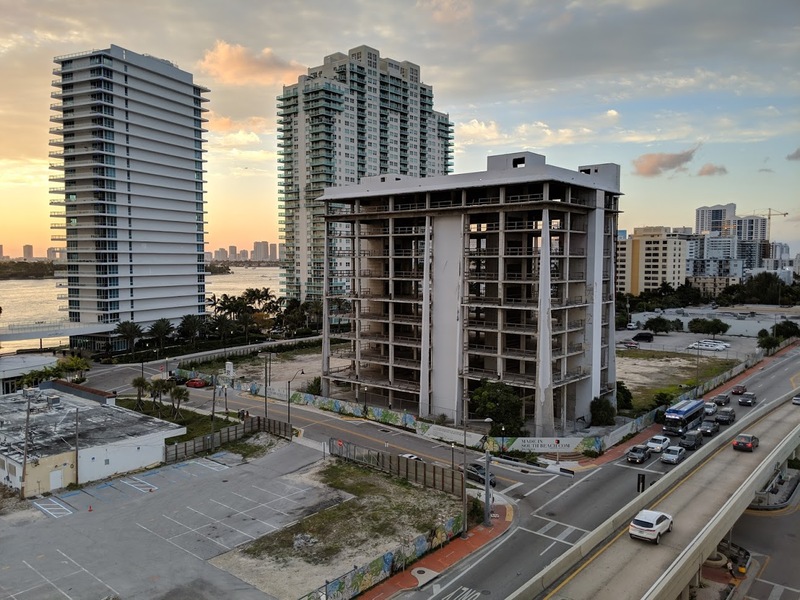 Miami Beach building officials initially denied the implosion permit, but Galbut won an appeal to the Miami-Dade County Board of Rules and Appeals. The South Shore Hospital shell was preserved by Galbut for around a decade in order to maintain his development rights (code only permits a shorter building). To replace South Shore, the second tallest tower ever on Miami Beach will be built elsewhere on the property, with 410 residential units in a 44-story, 510-foot tower. Also being built is a public park and a small amount of retail. Miami Beach commissioners approved a final deal in December for the much taller building, which is being designed by Arquitectonica. I love that Galbut doesn’t let the beach push him around. Those people are very difficult and they need to be put in their place from time to time. He got all that he asked for and more. Probably laughs at these amateurs. Don’t they realize that implosions are illegal? They violate both State and Federal regulations of fugitive particulates aka “Dust” Plus the dust is mostly composed of respirable silica which has to be controlled too. Didn’t they read the paper about the implosion of City Hall in Jacksonville and how the repairs to the adjacent structures are going to take over 1 year? How about the time they imploded the Sheraton in Bal Harbour and pitched a piece of concrete over 1,500 feet which hit a woman in the head. It damned near killed her. So you’re telling me a piece of concrete launched 1,500 feet and hit a woman in the head, and she only ‘almost died?’ Yeah, not sure I am buying that one. Maybe it bounced first. I saw them put her in the ambulance. It’s not like it hasn’t happened before. Like this…. Didnt they kill some one last time they imploded a building on miami Beach? Nah. They had a tractor chained to a column and pulled it. This will be more controlled. This time they’ll count to three before the tractor moves. During the Sheraton Hotel implosion in Bal Harbour they pitched a chunk of concrete a couple of thousand feet and it hit a woman. It damned near killed her. I think she had to get 60+ stitches. Luckily for the implosion company it was the owner’s daughter so they didn’t have to worry about a lawsuit. Shut up, just stay clear from it. You have to be the kind of moron who gets hit by a train illegally crossing tracks to get hit with concrete. Watch the video I posted. It’s happened before. In California it cut a mans leg off. In Australia flying debris killed a little girl. The last demolition incident happened because Miami Beach does not allow implosions. I work in construction on the beach and not allowing implosions means the demolition sub-contractor has to take the building apart piece by piece… hence why that building toppled over and killed someone. Implosions occur all over the country and it is the most efficient way to bring a building down. The beach needs to realize this and let construction happen. This is why downtown/brickell is seeing a boom and the beach is not. I was excited to read the report until I read the last word…. Why? Arquitectonica has designed many good looking towers. This project is well designed and a win, win for Miami Beach and its residents! This design is very boring and not a good looking tower. It looks pretty good for Arquitectonica nowadays. I wish we had more of this in Edgewater and Brickell, instead of Icon Bay and SLS Brickell. Check out the hideous renderings for the proposed pedestrian bridge as part of this project. go to re miami beach. it doesn’t connect the bay walks, it drops one off a block in land. I think it looks great you shush!!! Hideous tower. Galbut completely outgunned the City on this one. Not only did he get a tower he got the *tallest* tower in South Beach. The “park” will be in the shade most of the time too. Instead of building something urban and integrated into the streets they will have a suburban type “tower in the park”. Not sure if you visit the beach much, but South point park is rather popular and successful. Shade in the park is good, try visiting one from time to time. 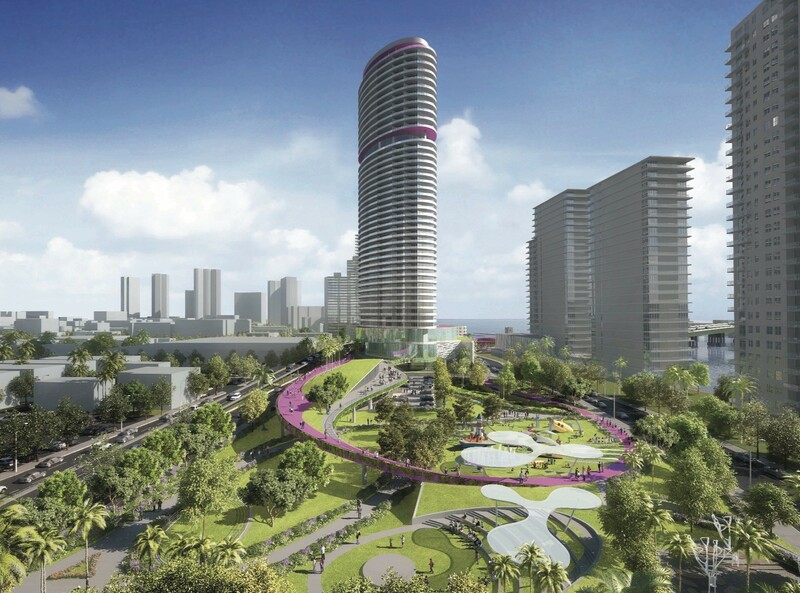 This park will be directly north of the tallest tower in South Beach. Half of the year with the sun to the south this park will always be in the shade. To some extent you are correct, the rendering below shows the sun coming in from practically the North, that will not happen. Have you been to Miami in the summer? Shade is a beautiful thing anywhere you can’t swim. Now that I hear the park will be mostly in the shade Im over thrilled that it will be built! Have you walked much from April to October? THRILLED I SAY!!!! hahaha. The park is primarily for residents of west avenue, most of which have pools on the west side of their building, directly in the sun. Why would anyone want a park in the sun? We have one of those, its called the beach.